Neil Shubin's new book explores the intersection of developmental biology, paleontology and genetics. Working at the American Museum of Natural History as a teenager, I often heard paleontology derided by scientists in other disciplines. They would call it glorified stamp collecting that lacked experimental rigor. They would question what it contributed to other scientific fields. And most vociferously, they would complain that dinosaurs always made the news while other more useful, if less photogenic, experiments languished without similar fanfare. For a long time, some of those claims had an air of truth to them. Paleontologists, especially vertebrate paleontologists, didn’t conduct repeatable experiments in the same way physicists or chemists did. And the advances made in vertebrate paleontology didn’t carry over into other fields in the same way chemistry, physics and medicine feed into each other. As for the claim that dinosaurs received undue attention, well, all I can say is people find T-Rexes more interesting than genes. And geneticists better get used to that. However, in the 1990’s, the chiding became more and more unwarranted. The discovery that a single group of genes regulated body plan and limb development in all animals introduced a genetic angle to the well understood link between development and evolution. That discovery directly connected the evolution studied in paleontology and the human body studied in medicine. After all, many pathologies result from developmental problems in the womb. There, at the intersection of evolution, genetics and development, a new field began to emerge. Called evolutionary development, or “Evo-Devo” for short, this new field linked human health to evolution by way of the genes that control our progress from worm-like fetus to cute child to jaded, book-reviewing journalist. In short, our eyes, hands, hair, every part of our body is nothing more than the piled-on artifacts of our evolutionary ancestors. Thus, by studying our ancestors, we can gain insight into the way we function. For the first time, paleontology, the field responsible for finding and studying those ancestors, became linked with human health. Neil Shubin stood at the center of that change. He could be seen as a paleontologist who does genetic experiments or a molecular biologist who also conducts Arctic expeditions in search of fossils. Either way, Shubin embodies the interdisciplinary nature of Evo-Devo. Shubin discovered a fossil later named Tiktaalik rosae during one of those Arctic expeditions. With a front like an amphibian and a rear like a fish, Tiktaalik became to devotees of Evo-Devo what Archaeopteryx (the part-bird, part-dinosaur fossil) was to the first generation of evolutionary biologists. It was proof of concept, pulled from the rocks at the top of the world. I met Shubin as a student at the University of Chicago. It was in his class that I first learned about the link between paleontology, genetics and medicine. He was teaching just as much paleontology to the students in his medical school anatomy class as to his paleontology students. Skeptical that paleontology could teach them about medicine, Shubin’s med students needed to be convinced that they couldn’t understand the human body without understanding the evolution of its parts. That lesson forms the subject of Shubin’s new book, Your Inner Fish. 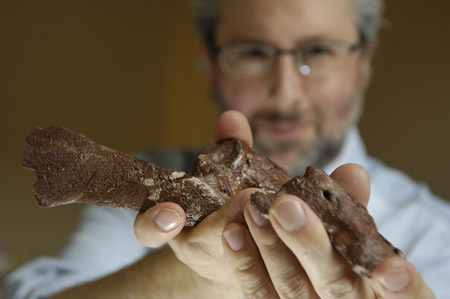 With Tiktaalik as that fish inside us all, and the Evo-Devo paradigm, Shubin explains how our bodies are living zoos, harboring the evolutionary remnants of our many animal ancestors. Throughout the book he details the evolution of different parts of our bodies: how we inherited ears from an ancient fish, our eyes from a jellyfish, and our arms from Tiktaalik. Essentially, we are all missing links, chimeras formed from the lengthy and inexact process of evolution. The book makes the argument with great élan. Shubin does an excellent job taking the reader on a tour of the natural history of the body by filling the book with colorful facts. For instance, who knew that the evolution of teeth also provided our bodies with the chemical blueprint for making breasts or that the formation of the jaw is linked to the functioning of the inner ear? But if I was one of Shubin’s medical students, I’m not sure I would be convinced that knowing sharks don’t get hernias would help me practice sports medicine. While the book does an excellent job of reviewing the history behind the human form, the final chapter, where Shubin attempts to link the discoveries of Evo-Devo to familiar ailments, falls a bit flat. He brings up numerous pathologies that result from artifacts left over from our haphazard evolution, such as knee problems and even choking. But he doesn’t say how, if at all, knowing the evolutionary background of the disorders enhances our ability to cure them. And in a way, that failure is not so much Neil Shubin’s problem as it is the last great problem of Evo-Devo. To fulfill the link Shubin makes between evolution, development and pathology, Evo-Devo needs to point a clear path from fossil to gene to cure. Despite the book’s deft take on a complex subject, I imagine that many people won’t care about their inner fish unless that fish can cure cancer. Of course, those are probably the same people who complain about dinosaurs making more news than proteins. So you probably shouldn’t be listening to them anyways. Physicists use what they know about bird evolution to simulate flight. A natural history museum starts up its own graduate program.